Hello Friends, Today’s card is to entice us and get us all excited for Spring! However, I think Spring here in Florida is coming more quickly then in the rest of the country and I am thankful for that. Sorry northern friends and family. I made this card for Two challenges: The Mod Squad and The Paper Players, where Spring is the theme. I can’t take complete credit for this card that would go to Vicki Beck a SU demonstrator, however I did alter it a bit from the original layout. My butterfly ripped almost in half as I was removing it form the die, but I refused to scrap it and was determined to make it work…hence only half of the butterfly is in front. What do you think? Does it look stupid? Hubby wasn’t a fan! I gave this card to my neighbor who is truly AMAZINGLY AMAZING! She suffers terribly from MS, it was her Birthday yesterday, and her father is dying. Through it all she still has the best attitude. I wish I could be more like her as she is truly an inspiration to me. All of the products used on this card are from SU. This is beautiful! An awesome spring card.! Love this card! I didn’t even notice the butterfly boo-boo until I read your deiscription and looked again! I am wondering how you created the background??? I can see that it is embossed, but how did you addthe lighter color??? Love your beautiful background! What a pretty Springy card. Didn’t even notice the problem you had with your beautiful butterfly until I read your blog. Looks great to me! Nicely done! This is gorgeous! Yay to you and your early Spring….me thinks it will not arrive here for a long time, I actually think that our snow will be here for at least another month…..blah! Love the background and I like the butterfly split this way, it’s quite lovely! Wow Nancy, this is gorgeous. I love the colors, they certainly remind me of spring! Thanks for playing along at The Paper Players! I LOVE your butterfly and those pretty colors, Nancy! FAB card! I really like that your butterfly looks a little different – it has character. Love your embossed background the lovely coloured stamp hiding in the background and of course the petite petals (love that set). Funny we used your sentiment stamp at the last few classes I went to. They are fabulous. And another fabulous card from you Nancy. 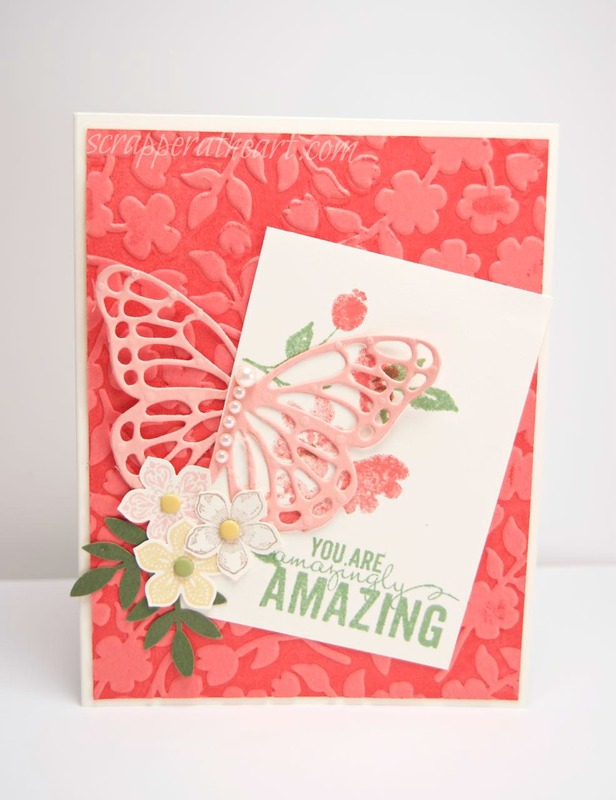 Fantastic layout and use of an embossed background and die cut butterfly! Love it. Beautiful. I love it and didn’t notice the butterfly until you mentioned it. It looks fine. I am sure your neighbor appreciated it. Have a wonderful week, my friend. Gorgeous card and good save! Thank you for joining us at The Mod Squad Challenge! Nancy, omg, this is GORGEOUS…yikers. Way to save that butterfly too…I thought you did it on purpose! Thank you so much for playing along with The Mod Squad Challenge this week. What a lovely bright card for Spring! I love the butterfly layered over the stamped flowers and all of the texture that your embossing and punched and diecut shapes add. 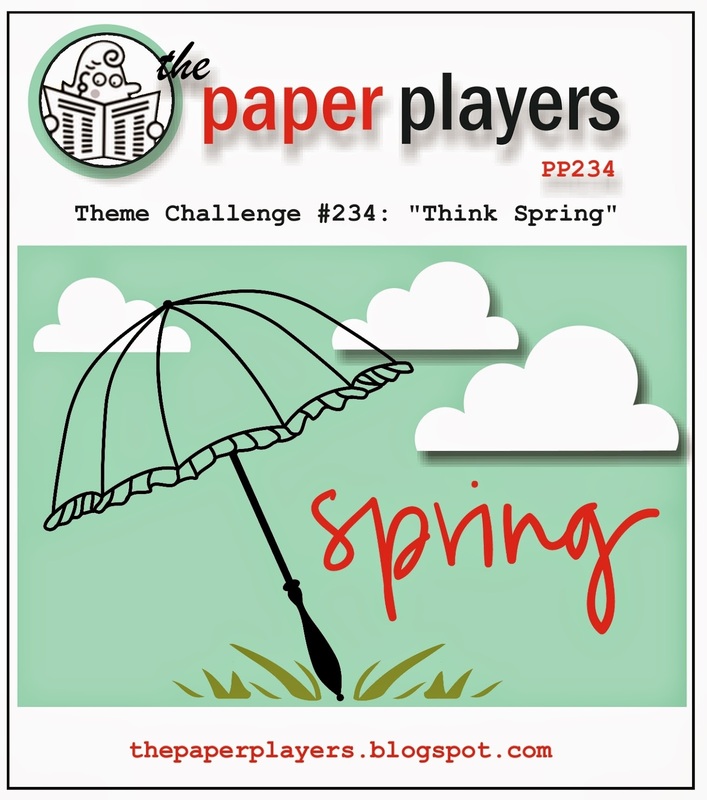 Thanks for joining us for our Spring Challenge over at The Paper Players this week! What a beauty, Nancy! The coral color is perfectly ‘spring’, and you have put together a wonderful collage. Of course it was you that made this card come to be! Thanks again…I enjoyed your class! !